On the 18th of October 2017 we had the pleasure to host in Rome the European Multiplier Event of Senior Plus project, held at Porta Futuro job center. After a huge work over the last 2 years, the event offered the opportunity to present publically the results and the intellectual outputs developed during the Senior Plus European project. Professionals, institutions, organisations and citizens interested in new pathways aimed at reinforcing employability of people 50+ were invited to the event. Representatives of employment centres, information and orientation centres, universities, organisations in the field of education and social inclusion honoured us with their presence. A total of 105 people attended the event, 31 of which were international guests. Organisations active in the field of learning mobility from France, Portugal, Spain, Hungary, United Kingdom, Romania, Poland, Greece, Slovenia, Croatia and Bulgaria, part of the LE.MO.N. 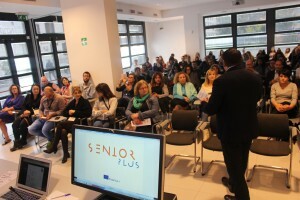 Network followed the presentations and expressed their interested in the Senior Plus results and tools developed, particularly regarding the use of the E-Portfolio and the Europeanpathfinders learning mobility platform for 50+. The Italian senior participants that followed the Senior Plus training pathway and challenged themselves through a period of local or international volunteering joined us also in this important day to testimony through their presence and video interviews of the impact the project had on their personal and professional learning. The event followed 6 moments of presentations throughout the morning from 9.00 a.m. to 1.00 p.m.
Half way through the participants enjoyed a moment of informal exchanges accompanied by a coffee break organized by the Cooperativa Garibaldi, one of our local partners in Rome that hosted Senior Plus volunteers during the international volunteering phase of the project. During the event we have not only shared the results of the project, but we have also shared what we are preparing for the follow-up of Senior Plus. We will continuing working on learning opportunities for senior people through the European Pathfinders platform now totally functioning, but also thanks to a new ERASMUS+ project focused on 50+ target group, coordinated by Community Action Dacorum, SENIOR ACTIVE! Posted in: Notizie Senior-Plus This entry was posted on Monday, October 23rd, 2017 at 3:54 pm You can follow any responses to this entry through the RSS 2.0 feed.